Falling into the background noise among more famous Southeast Asian cities like Singapore, Bangkok or Hanoi, Kuala Lumpur unveils one of the biggest urban surprises on the continent. Brushed with gleaming skyscrapers, glitzy (but surprisingly budget-friendly) luxury hotels, and some of the best food on the planet, it’s not hard to see why the pumped-up capital of Malaysia is quickly becoming a favourite on the traveller trail. As one of the main transportation hubs in the region, there’s a good chance when criss-crossing Southeast Asia that you’ll end up, at some point, with at least one day in Kuala Lumpur. Whether you’ve got 10 days in Malaysia or three weeks, there’s hardly a better starting point for your journey than the brilliant capital, Kuala Lumpur (or just KL as its most endearing fans would say). Preparing for your Kuala Lumpur itinerary? Don’t forget to protect yourself with travel insurance! While you won’t need to beat yourself out of bed at the crack of dawn to catch KL’s biggest attraction—both literally and figuratively—get a head start on the morning by plowing over to the Petronas Twin Towers. This towering landmark, the undisputed symbol of Kuala Lumpur, was until 2004 the tallest building in world. Even if it’s been overtaken 15 times since, the Petronas Towers are still one of the finest modern architectural treasures in the world and one of the absolute must-sees in Malaysia. Unless you purchase your Petronas Towers tickets beforehand (which I’d highly recommend! ), you’ll need to start lining up at the ticketing counter before 8:30am to grab one of the limited tickets, available on a first come, first-serve basis. Once you’ve secured your entrance tickets, scoot up 170 metres to the 86th-floor observation deck where spellbinding views of KL await. Your Petronas Towers tickets also include entrance to the Skybridge, a covered glass platform linking the twin towers on the 41st and 42nd floors and offering its own spectacular views of the city. 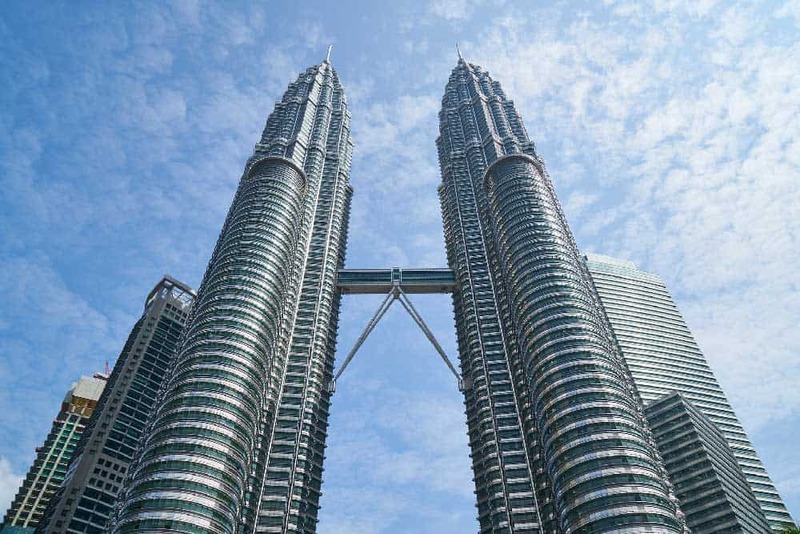 Want to make the most out of your visit to Petronas Towers? Check out these skip-the-line options and hand-picked KL tours! Skip-the-Line Petronas Towers Ticket: Avoid the long queue at the Twin Towers with these convenient skip-the-line tickets. Includes delivery to your city centre hotel! Petronas Towers and KL Tower Tickets: Can’t get enough KL from above? Combine a visit to the Petronas observation deck and skybridge from the city’s other top viewpoint, KL Tower, with these combo tickets. Delivery to your hotel in KL is included. 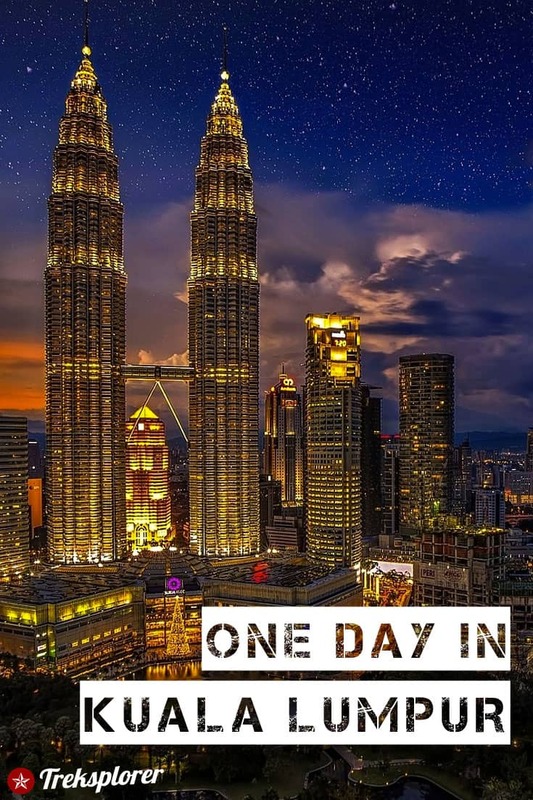 4-Hour Tour and Twin Towers Visit: Get more out of your time in Kuala Lumpur with this action-packed 4-hour guided tour through some of the city’s best tourist sites. The excursion includes admission to both Petronas Twin Towers and KL Menara Tower as well as transportation and hotel pick-up. After you’ve fully soaked in the views from the Petronas Towers, head over to nearby KLCC Station (8 minutes by foot) for the short train ride to Masjid Jamek Station. From here, it’s a short 5- to 7-minute walk to Merdeka Square at the historical heart of KL. There’s a handful of other attractions around Merdeka Square including the Kuala Lumpur City Gallery and the National Textile Museum. With only one day in Kuala Lumpur, you’ll probably want to give them a miss unless you’re a huge history-buff or a closet batik connoisseur. Interested in the history of Kuala Lumpur? Check out these recommended city tours! Best of Kuala Lumpur Tour: Fit in all the best of the city on this full-day guided tour! Highlights include Petronas Towers (admission included), Merdeka Square, National Mosque, and Batu Caves. 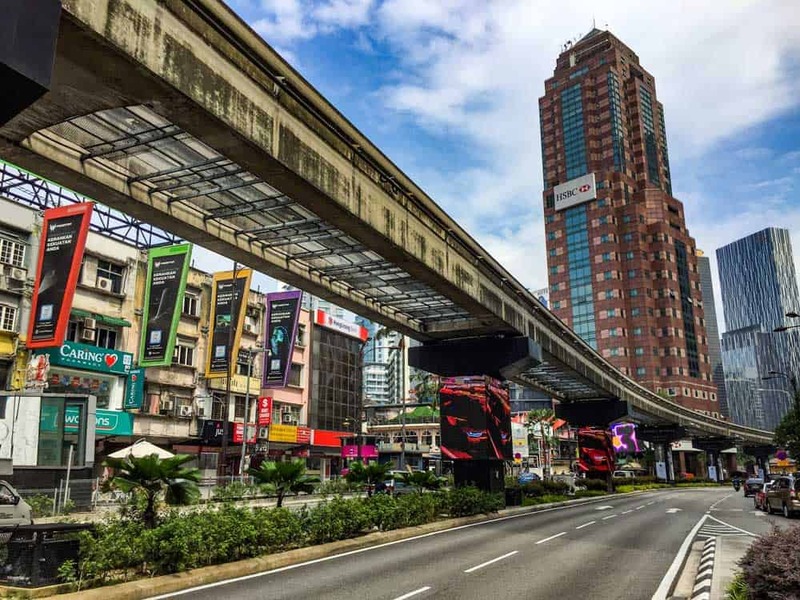 10 Wonders of KL Tour: Join in on this private full-day tour of all of the city’s best attractions including the Twin Towers, National Museum, Chinatown, Brickfields (Little India), Central Market, and Thean Hou Temple. Private KL City Tour: Hop onto this affordable half-day private tour to learn about KL’s history while exploring some of its top sites. Includes a side trip to the beautiful Batu Caves outside of the city centre. Once you’re done absorbing the sights and sounds of Merdeka Square, cross over the Klang River via Leboh Pasar Besar and head south along the eastern bank to one of KL’s cultural landmarks, Central Market. Built in 1928 with roots digging back to 1888, Central Market has transformed from a quiet wet market into a handicrafts nirvana. Browsing through the torrent of stalls at Central Market is like staring down Malaysia in miniature, with everything from Malay batik to Indian saris to Chinese sculptures in your sights. Besides selling a wide array of handicraft and souvenirs, Central Market is one of the best places to eat in KL on a budget. From asam laksa and dumplings to fresh fruit juices, all kinds of mouth-watering Malay food & drinks await in the upper food court at prices that would probably barely get you a bus ride back home. Just don’t fill up too much: There’s plenty more in store for your belly as you continue your KL itinerary! Got delicious food on the brain? Indulge your cravings on one of these oh-so-yummy food tours! Half-Day Food Walking Tour: Eat your way through the cornucopia of Indian, Malay, and Chinese flavours of KL on this 3.5-hour guided food walk through Brickfields and Chinatown. Off-the-Eaten-Track Food Tour: Dig through the city’s hidden food stalls at four different stops on this offbeat 3.5-hour tour. Food samples include local favourites like satay, nasi goreng, and hokkien mie. Kuala Lumpur Food Tour: Taste 10 delicious Malay, Indian, and Chinese dishes on this flavour extravaganza wandering through Chow Kit Market, Kampung Baru, Masjid India, and Madras Lane. From Central Market, it’s a quick walk down Jalan Tun Tan Cheng Lock to Jalan Petaling (Petaling Street), the central nervous system of Kuala Lumpur’s Chinatown. The area is one of the most exciting in KL, constantly abuzz with action day and night, and an absolute must-visit during your first 24 hours in Kuala Lumpur. 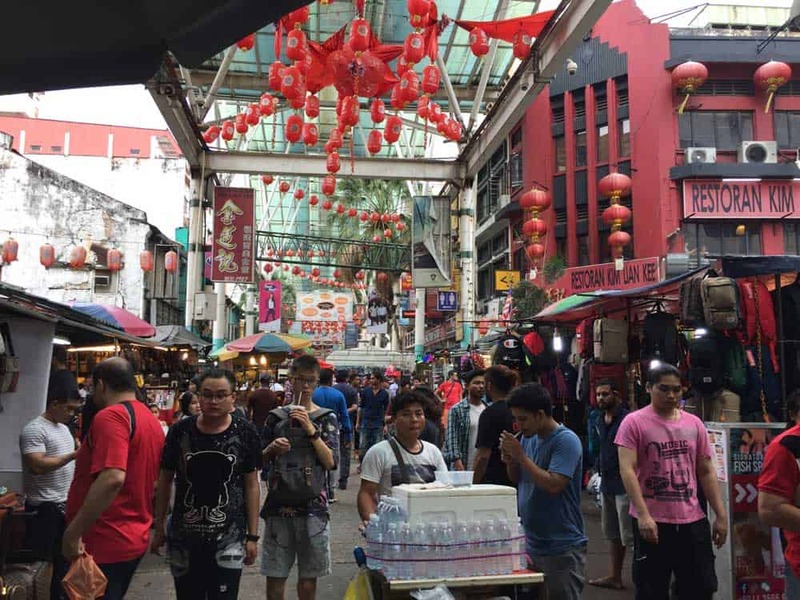 Walking along Petaling Street, you’ll feel as if you’ve magically stepped from Malaysia’s capital into the streets of Hong Kong, Shanghai or Beijing. The atmosphere is lively along the street where kiosks pop out from the buildings under awnings and umbrellas as shopkeepers beckon you to buy their latest wares. Chinatown is the perfect place to sharpen your bargaining skills. You’ll find everything from clothing and fashion accessories to handicrafts and souvenirs here all at bargain-basement prices that’ll astound you—even before haggling them down. Restoran Kim Lian Kee: A KL classic that dubs itself as the originator of hokkien mee, a delicious combo of stir-fried noodles and a thick dark-soy-based sauce. Restoran Koon Kee Wan Tan Mee: A restaurant with over 50 years of history backing it serving up KL’s best wan tan mee, a Cantonese favourite consisting of noodles in a sweet black sauce topped with ingredients like sweet BBQ pork, chicken, and dumplings. Old China Cafe: A small restaurant with an old-world feel delivering Peranakan (Straits-born Chinese) food including their spicy & juicy beef rendang. Before you leave Chinatown, don’t miss a chance to see Sri Mahamariamman Temple, an ornate 19th-century Hindu temple that seems wholly out-of-place among the Taoist & Buddhist temples scattered elsewhere in Chinatown. Ready to explore Chinatown deeper? Check out these recommended tours! Petaling Street Food Tour: Indulge in the tastiest food KL has to offer on this 3.5-hour tour through the heart of Chinatown, sampling local dishes like ikan bakar (BBQ fish), yu tiao breadsticks, and kaya jam (toast with coconut jam). Food Trail Walking Tour: Join in on this 3- to 4-hour small-group walking tour to experience the sights, sounds, and, most importantly, flavours of Chinatown. Brickfields, and Bangsar. 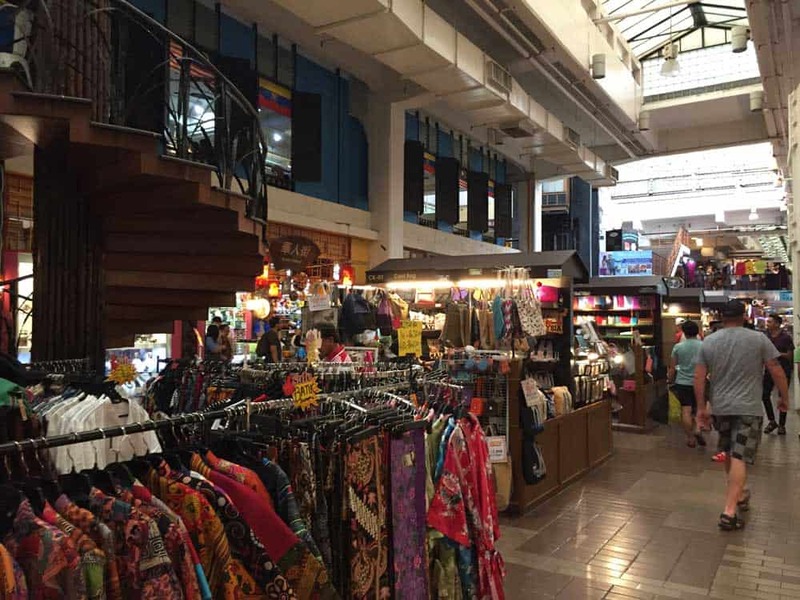 Night Market Tour and Buffet: Explore KL by night on this private evening sightseeing tour through Independence Square, Central Market, and Petaling Street. Round-trip hotel transportation and a buffet dinner is included. After immersing yourself fully in the delights of Chinatown, head back towards the Klang River to Pasar Seni Station where you’ll ride over to KL Sentral to continue to explore KL’s diversity in Little India. Officially known as Brickfields, Little India is one of the Malaysian capital’s more colourful corners, plastered with curry houses and shops blasting Hindi music onto the street while selling everything from saris to Bollywood DVDs to spices. Since your appetite probably hasn’t yet reeled from your Chinatown culinary adventures, skip on the area’s famous banana leaf rice & curry dishes (this time!) and opt instead for a delicious & refreshing mango lassi to help you cool down in KL’s mid-day heat. Looking to learn more about Brickfields? Hop onto one of these top tours! 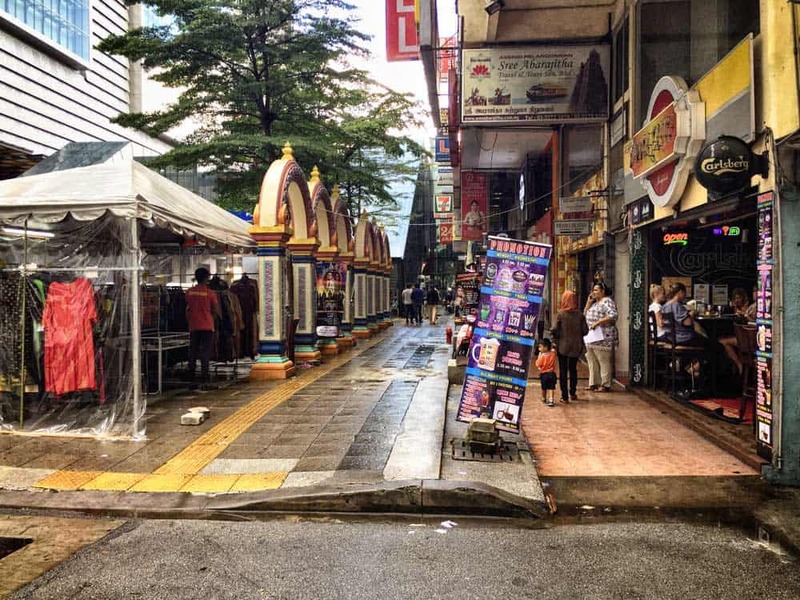 Discover Brickfields Tour: Tackle the bustling streets, markets and temples of KL’s Little India on this 1.5-hour private tour! Private Religious Tour: Learn more about KL’s religious heritage on this private tour through Batu Caves, Masjid Negara, and Thean Hou Temple. Includes a tasty lunch in Brickfields. With the bulk of a day spent haggling, walking and sightseeing, I’d say you’ve earned a little downtime. In a city sprinkled with epic views like KL, there’s no better way to do it than to chill out at a rooftop bar. There are plenty of rooftop bars in Kuala Lumpur, but one of most acclaimed is SkyBar, located on the 33rd floor of the Traders Hotel in KLCC. Besides enjoying one of the city’s most innovative cocktails and rubbing elbows with KL’s well-to-do, an evening relaxing at SkyBar places the best views of Kuala Lumpur front-and-centre including a majestic view of the Petronas Towers. Another option for unfettered KL city views is the Heli Lounge Bar. Situated on the 34th floor of Menara BH Building on a helipad, this popular spot features wonderful 360-degree vistas of the Petronas Towers and KL Menara Tower with zero hindrance. Both the SkyBar at the Traders Hotel and the Heli Lounge Bar are within a 20- to 30-minute walk from KLCC Station (5 stops and 10 minutes by train). Ready to make the most out of your evening? Book yourself onto one of these top-rated KL nightlife & food tours! Local Street Food Night Tour: Experience KL as it’s meant to be—through the tastebuds!—on this 2-hour evening food tour Hutong Food Court, Jalan Alor, and Mamak SK Corner. Menara KL Tower Dining Experience: Dine to tremendous skyline views by hooking yourself up with this ticket for the Atmosphere 360 restaurant atop KL Tower. Discover the Magic Evening Tour: Illuminate your tastebuds to sunsets and bright evening lights on this value-laden private 3-hour excursion. Tour includes a drink at the famous Heli Lounge Bar and food sampling along Jalan Alor in Bukit Bintang. All that hard work of snagging world-class panoramas has surely resurged your appetite, no? If so, fire up your legs for the short walk south to Bukit Bintang, one of the coolest areas in KL, bursting with local & international restaurants, classy bars, and trendy boutiques & shopping malls. Jalan Alor: Quite possibly one of the best food streets in Asia, Jalan Alor offers some of the best street food in KL ranging from grilled satay skewers cooked to perfection on charcoal grill to stir-fried noodle dishes tossed around in woks. Lot 10 Hutong Food Court: A hawker centre with a layout inspired by the hutong of Beijing, this culinary nirvana features handpicked favourites from popular food vendors from around KL and even as far as Penang. Top dishes include hokkien mee and wonton dumpling soup. Bijan Bar & Restaurant: An award-winning restaurant focusing on Malay cuisine. Among the restaurant’s specialties is their beef rendang, a beef curry slow-cooked to spicy perfection. If you’ve got a little more energy to spare after eating to your heart’s content, spend the rest of the evening browsing Bukit Bintang’s fashion boutiques and malls or letting loose by partaking in its legendary nightlife. Need a little evening action around Bukit Bintang? Check out one of these nightlife tours! Discover the Magic Evening Tour: Sip a cocktail at the Heli Lounge before retiring to Jalan Alor for some tasty treats on this 3-hour tour! Kuala Lumpur Nightlife Experience: Enjoy the best KL nightlife on this 4-hour evening excursion through Jalan Alor and Changkat Bukit Bintang. The Kuala Lumpur Journal Hotel: A modern hotel with retro twists thrown into the delightful chaos of Bukit Bintang. The rooms are sleek with superb city views, but this hotel’s at its best peering out onto KL from the rooftop infinity pool. Traders Hotel: Home to the famous SkyBar, this 4-star hotel delivers on modern rooms with incredible floor-to-ceiling views. Chill out at the spa’s steam room or hot tub to unwind after a long day of sightseeing. Grand Hyatt Kuala Lumpur: One of the best luxury hotels in KL, this 5-star gem spikes up the serotonin with its palatial rooms and spellbinding vistas. By air: Most travellers coming from abroad will enter KL—and Malaysia—via Kuala Lumpur International Airport (KUL). This airport is hub for several airlines including AirAsia and Malaysia Airlines, and, as such, makes KL a popular layover destination. Looking for cheap flights to Kuala Lumpur? I’d recommend searching for airfare deals on CheapOair! I’ve been able to find much better fares on international flights this lesser-known OTA lately than on more popular sites like Skyscanner. By bus: Malaysia offers an excellent budget-friendly network of buses to get you around the country. Some of the most popular routes include Melaka (2.5 hours), Penang (6 hours), and Singapore (5-6 hours). Want to embrace nature? Fit in some time at KL Bird Park, a relaxing oasis amid the chaos of the city, not far from KL Sentral. Love seeing KL from above? Pop over the KL Menara Tower for some of the best skyline views in the city. Obsessed with history? Snag a few hours at the National Museum of Malaysia, interactively covering the country’s history from the prehistoric age to the modern era. Searching for KL’s architectural roots? The Malay area of Kampung Baru gives a hint at the city’s humble aesthetics prior to its resource-fueled building boom.